Kerala dining hall designers open a new gateway to choose the best designs from Kerala house interior designs. The traditional woods used for decorating our dining area. In contemporary designs the space always keeps empty. The empty space highlights the elegancy of the dining hall. There is a minimalist use of accessories too much of article doesn’t suit to in the contemporary style. Now the falls ceiling becomes more popular for ceiling the roof gypsum, wooden materials are used. Through the falls ceiling we can creates a magical look to the dining area. While designing the dining hall we must study some aspects of designing, we can design the dining hall in any style like contemporary, classic style, antic style hi-tech style. Before selecting a design we have to consult a good designer to discuss the viability of the work. The designers can decide what kind of design should cover your needs and suitable to our budget. This is one of our previous works. It is a contemporary style dining hall layout. There is no partition made. Here is a dining table and set of chairs it is fabricated cushion chair create a different look to dining area. 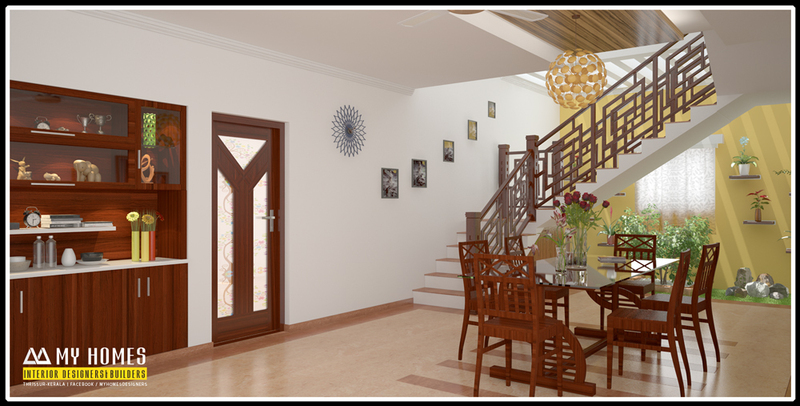 The wooden dining table designs kerala is covered with glass panel. The theme color of the dining room is off white the dark brown and yellow is used to highlight the selected area. The hand rail is finished with wood. The hand railing can be furnished using steel, and glass material. Vast number of designs is get for creating the elegant railing. There is a small portion is allocated for vertical garden. The greenish effect lends us freshness and charming atmosphere. For flooring the granite is used. There are many ways to improve the total outlook of the dining area. Through a fruitful design we can transform ordinary look of the dining hall into a spectacular one.